AccessibleTech provides Information Technology services that include Accessibility Compliance and IT consulting for section 508. The Rehabilitation Act section 508 (Part of the Americans with Disabilities Act - ADA) and the Web Content Accessibility Guidelines call for accessible IT systems to people with special needs. The provisions of 508 are directed for all IT systems, including web sites. Accessibility is a requirement for all deliverable systems to the federal government, including the web sites of contractors if they are used by government personnel. 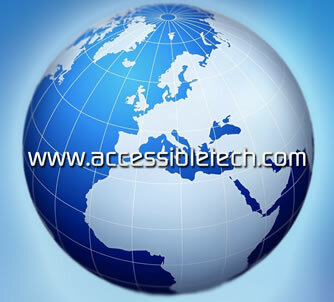 AccessibleTech Inc. provides services that make IT systems compliant with section 508 of the Rehabilitation Act. The services include implementation of accessibility guidelines to new IT systems as well as retrofitting existing web sites to make them 508 compliant. Maintenance services are provided for changes and updates after the initial completion. Maintenance includes testing and editing the updated sections. The primary Labs of the AccessibleTech Inc. is to keep the site's structure (architecture) intact as much as possible and make the transition as less evasive as possible. In some instances structural (architectural) changes may be unavoidable; however, a sincere effort will be applied to keep these changes to minimum.